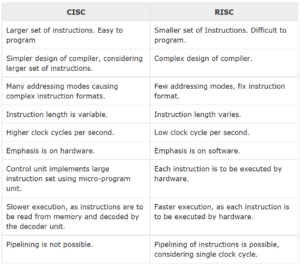 CISC is a Complex Instruction Set Computer. It is a MCU that can address a large number of instructions. In the early 1980s, computer designers recommended that MCU should use fewer instructions with simple constructs so that they can be executed much faster within the MCU without having to use memory. Such MCU are classified as Reduced Instruction Set Computer or RISC.